Hilton Lake Taupo is only few minutes away from town center and if you need to fly somewhere, it is only 15-minute drive from Taupo Airport. This Lake Taupo hotel has an outdoor thermally heated pool, hot tubs, free gym access and features views over New Zealand’s largest lake with views of the surrounding majestic mountains. When you get bored, guests can visit the nearby Motor Sports Park, go bungee jumping or take a trip by private helicopter. The Hilton is definitely our pick for the best Lake Taupo accommodation for luxury travelers. If you don’t have a budget then you can choose any of there exclusive rooms. Twin Peaks Lakeside Inn is 1-minute walk from the lakeside beach. Even if you’re away from home, you won’t miss out anything because they have free WiFi throughout the property. You can enjoy the beautiful sunset in their on-site pub while enjoying your favorite drink. Great location, awesome hotel staff, there’s nothing more you could ask for. You will love walking around the neighborhood of Gables Lakefront Motel because it’s close to almost all the local destinations. Wairakei Natural Thermal Valley, Lake Taupo Hole in One Challenge, and Taupo Bungy are all less than 1.7 kilometers away. No wonder why most guests said it’s the “Best Taupo accommodation” in town. If you’re looking for a Budget Taupo Hotel, All Seasons Kiwi Holiday Park is what we can recommend. They have a huge place, 39 guestrooms, arcade room, playground on the site, and close to famous destinations such as Taupo Museum and Art Gallery, Taupo Bungy, Taupo Hot Springs, Barbary and heaps of activities around town. If you’re a young backpacker and don’t mind staying in the cheapest Taupo hotel, then this is perfect for you. You can choose from mixed, all males or all females dormitory rooms. When the night is young, socialize with other guests, have a barbeque, and chill on the terrace. They are rated as the highest value in Taupo where guests get more value for their money. This new property has an outdoor pool and only 2 minutes away from the beach. Spacious rooms, clean and quiet. Close enough to the town centre, you can walk or ride a motorbike. This is what most guests’ favorite part of Taupo, making it one of the great Taupo accommodation in town. Truly a home away from home. Sauna and hot spring are popular in this hotel. You can chill at their outdoor pool while enjoying the views of the lake. If you want to experience heaven in your mouth, don’t forget to try their chocolate cake with ice cream log. Then finish off the night with a spa bath to pamper yourself and sleep in their comfy bed. This is one of our picks for the best Lake Taupo Accommodation for mid range travelers. Enjoy the year-round outdoor pool and barbecue at Courtney Motel. If you want to get a tan, go sunbathing at the beach. It’s very close, only 3-minute walk. Most guest like the stylish room and the great staff service. What’s nice is that Lake Taupo Hole in One Challenge and Wairakei Natural Thermal Valley is only a few kilometers away. You will have a nice stay at Courtney Motel for sure. VU Thermal has a great location, it’s perfectly situated on the lakefront with amazing views of mother nature. They have a massive 500 sqm terrace deck where you can use as a viewing platform by the lake and mountains. Restaurants and markets are also close to the lodge, convenient for all types of travelers. The VU lodge is our pick for the best Lake Taupo accommodation with amazing views. The Sails on the Lake have great room layouts that most guests like. It’s also walking distance to a couple of restaurants but not too close to the city centre. If you’re looking for a comfortable place to stay and has an excellent value for money, this is definitely it. Stay in one of their 52 rooms with magnificent lake and mountain views. Capture that perfect sunrise photo for your Instagram right inside your hotel room. Many rooms to choose from; studio, one, two or three bedrooms. There are only two words that perfectly describe this hotel; modern and clean. Great Lake Taupo is only .1 km away, you can run around the area then finish off with their thermal hot tub. Hire a bike then drive to the town center, grab a bite at the nearby restaurants and chill at the pool. Cozy and lovely Taupo accommodation. I hope the list helped you pick a suitable accommodation for your next Taupo trip. 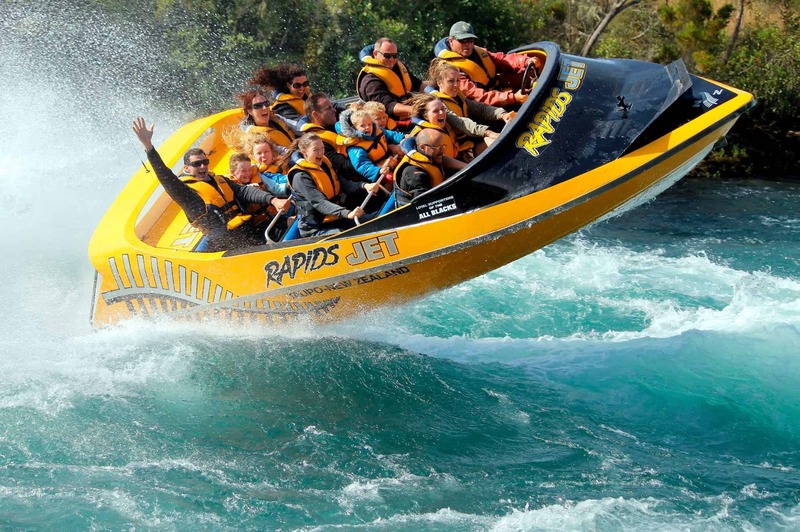 Whether you’re into sight-seeing, hot pools, fishing or jet-boating, Taupo definitely won’t disappoint you. Everybody in your group will have heaps of fun there for sure.